You will not see too many Sky/Solstice at trackday events since there is not a roll bar solution due to the interior room. Also, the manufactures of the hardtop will only sell them to racers who can prove that they are going to race in a series. Most organizerrs require a roll bar or a hard top for convertibles. Any final price on the 15/16 blue TE37? Is the offset ok for track use? We have final pricing. I will PM you. Can I get a price on the CE28's? Black? My front wheels came in Friday.. Still waiting on the rears I still had a set of center caps left over from a set of bronze CE28N's I used to have on my RX-8. 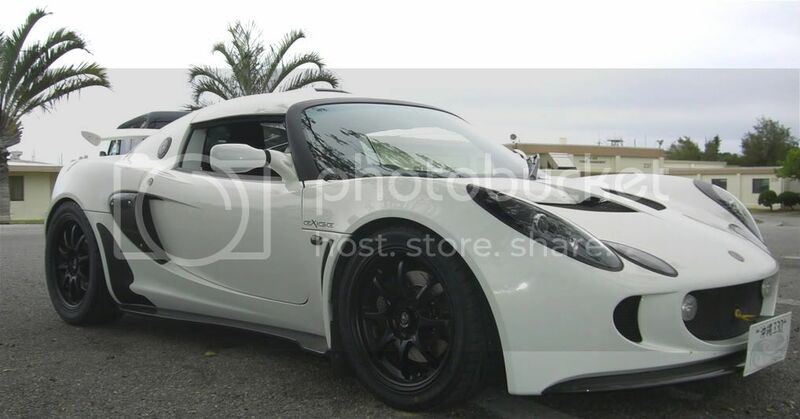 I painted them black and got the 3D lotus steering wheel emblems from Chuforia Graffix that fit perfectly in to them. Overall I think the center caps look pretty good. Here's a quick cell phone pic. Last edited by Dragon; 02-22-2009 at 09:00 AM. Those look sick. Silly that they didnt all come in at the same time. 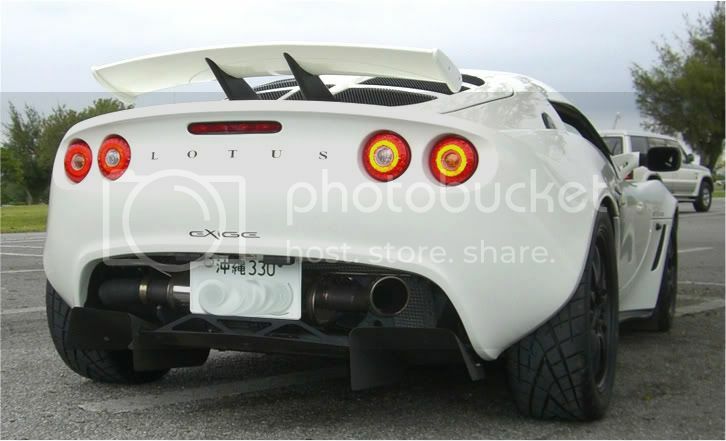 Definitely need more pix, very good looking wheel on the Exige. 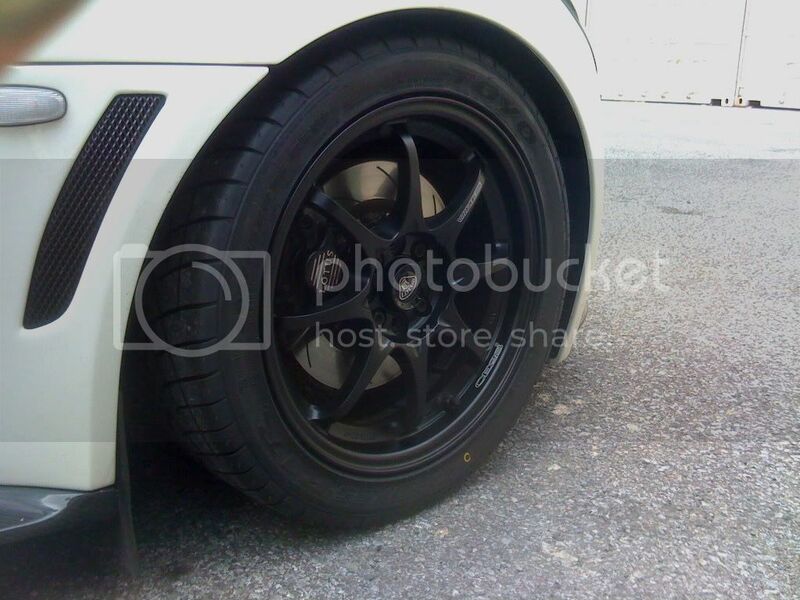 Will post pic's when I get the rears in and on the car..
Can I get a price for the ce28's in gunmetal? Could I get pricing for a set of the TE37 in Magnesium Blue? This wheel / tire combination dropped about 26lbs of total rotating weight off the car vs stock Exige wheels and A048's for those that are wondering. Last edited by Dragon; 02-28-2009 at 02:01 AM. Very nice Dragon! Its looking excellent. Could you please PM price for TE37 in 16/17 in black and mag blue. How close is mag blue to lotus color Night Fall Blue? The Diamond Blue(mag blue)is pretty dark. in the sun it is really blur though. This is an overcast day. Sorry for the late reply.. I was on vacation with limited interweb access..
Any price on a pair of 15" CE28N's in black yet? I want to get a pair for the front to run R6's on for AutoX. Yea, shoot me a PM when you are ready to get them, and we will order them up.